Yoga & Hops – Yoga. Breweries. Local. Fun. Peter is partnering with Yoga&Hops to create a class that includes a 50 min full body workout led by Peter followed by a 20 min yoga cool-down led by Cindy and Angie of Yoga&Hops. Class will be held in the beer garden of Karbach Brewing Co. where we will stay to socialize and grab a beer after class. Don’t miss out, subscribe to the Y&H Brewsletter! WE'LL HOOK YOU UP WITH SPECIAL OFFERS AND KEEP YOU IN THE KNOW AS WE ADD NEW BREWERIES. What is Yoga & Hops all about? 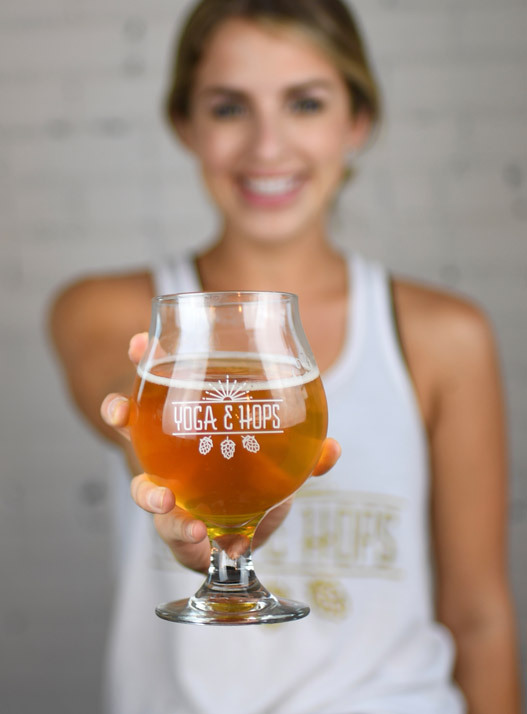 Yoga&Hops holds yoga classes at local craft breweries. Y&H is about bringing people together to connect and be social with one another before, during and after class! It’s an opportunity to meet up with friends and make some new ones at the same time! Yoga is traditionally held in a studio environment; what’s so unique and wonderful about Y&H is the vibe, which is a result of holding class in a new location - a brewery! The environment makes Y&H approachable to the masses and thus appeals to a wide variety of folks. Regular yoga practitioners to newbies alike feel welcomed at Y&H, classes are leveled so everyone in attendance can have a great practice and feel challenged to their individual level. The hour yoga class is followed by beer drinking, of course (one beer is included)! We can’t wait to hang with you at our next class - mark your calendar! Isn't it about time you joined us at Yoga & Hops? The health benefits of beer include anticancer properties, a reduced risk of cardiovascular diseases, increased bone density, the prevention of dementia and coronary disease, aid to the digestive system, and anti-aging properties, as well as treating diabetes, gallstones, kidney stones, osteoporosis, and hypertension. Feeling hoppy? One study has found that those little hops could reduce acute inflammation in study subjects. Researchers say the hops in beer may be responsible for the correlation, helping to slow the release of calcium from bone – which could get reabsorbed by the kidneys as painful stones. In addition, a person’s social networks and community are very important to their well-being, especially when it comes to working out! There are a number of psychological and physical benefits of working out with friends. At Y&H people can connect with their community in the yoga portion of class and by throwing a few back with friends after class. Part of what makes Y&H so unique and special is the local community aspect, so come get hoppy with us!